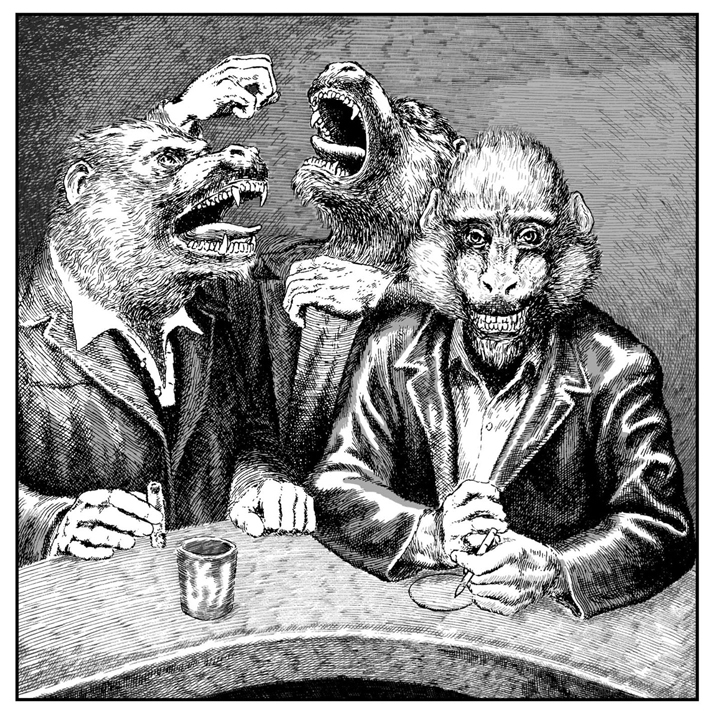 THREE BABOONS The three of them leaned against the bar, posturing as fine examples of erudition and taste. “There,” the one said definitively, and nodded. Three years ago, he had established an advertising agency, which proved to be profitable at a time when others were folding in droves. He was a shrewd man, many believed. He knew people, understood their character. Call it a knack. His word meant a good deal to the other two, although neither would admit it. “Yes. That one. She’d do it,” he continued. The others looked toward the end of the bar, trying to determine whom their friend had indicated while remaining disinterested, in a tasteful way. The third one had been born wealthy. Therefore, the others respected his opinion intuitively, although neither would admit it, without really knowing why. “She’ll do it,” the first reiterated, “Guaranteed. She’ll do it.” There was something funny about the way he said ‘guaranteed’, like he was chewing on ice, and it hurt. The second, a millionaire by the time he was thirty, believed he deserved more respect than that. “Shut up,” the first repeated, then ambitiously began writing his proposal on a paper coaster. He would send her a drink with the coaster note under it, a trick he had learned in a James Bond movie. He would show them how well he knew character.